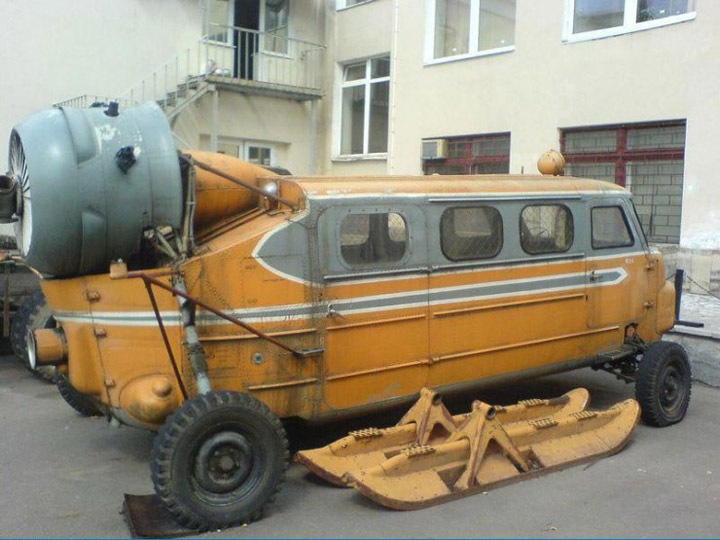 As u might understood snowmobiles have to be popular in distant Russian areas which are covered with snow 8 months a year. We’ve already told about one of them in our news. 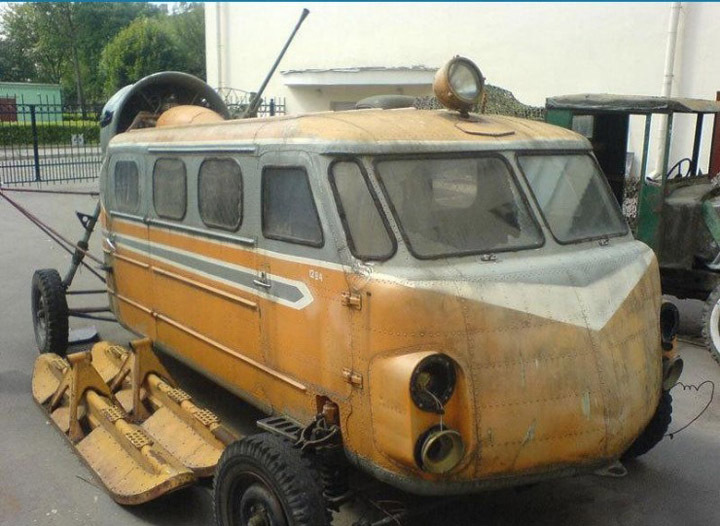 The snowmobile Sever-2 (North 2) was created from the legendary Soviet automobile Pobeda (Victory) in 1959. It was able to move on snow or ice perfectly. This one, submitted by our reader Sergei, has the common features with Sever-2. Unfortunately we don’t have any information about this vehicle. But it looks UAZ alike. And as it can be seen, it is able to move on the wheels or skis as well. every thing looks ok,but at the end or front!! !what is that?a turbo prop pusher or pulling fan!! !it might be last source of getting out form the heavy snow.other thing i thought that this fan is for the comfort of unfortunate passangers.this machine look like the honymoon vehicle. If this UAZ is rocking, don’t come knocking. I think you are supposed to use that fan while _on_ the snow and if its too soft, then use tires to get out. Sort of hovercraft of snow. It looks like a Kamov Ka-30. Hey guys! Are we having a good time yet? Yes and is there anything you would like to share with us about Igor? I guess u were right in a previous post: Don’t play post-apocaliptic RPG’s, come and live in russia. You are right. It is the same vehicle. Perhaps it will be restored. 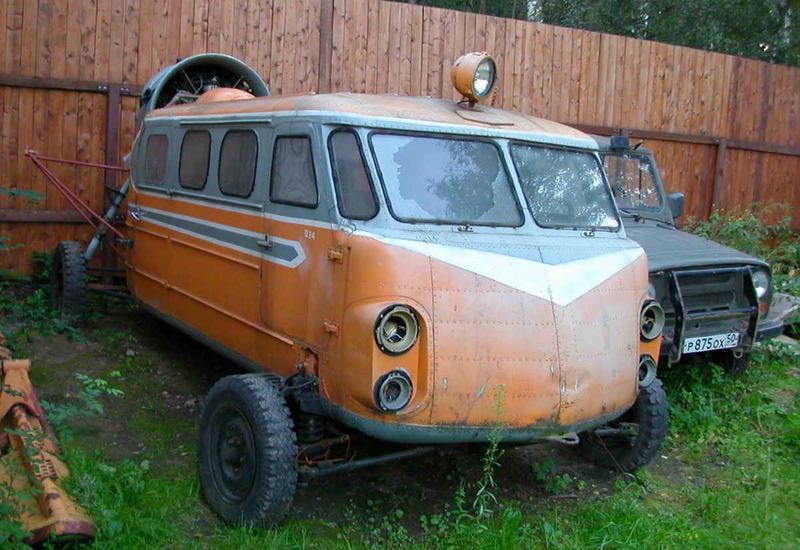 I would like to restore this rocket of UAZ, and then take it to where the snow rules the world, pop in some ZZ Top tape… and DRIVE! To the oblivion! Is that why you want to drive the UAZ? I wish you a long and healthy life. Please be careful with that White Russian. the grey thing at the rear is a radial engine inside a duct, with a cooling fan at the rear. in the lower picture you can see the hub for a 3-blade variable pitch propellor, blades are not mounted. It seem to be so nice. I like the colors and the great effects. You have a nice collection together here. Some look more recent than classic, although I could see the 70’s look in some images. Actually, it’s not UAZ. It is another Soviet car called ErAZ – Erevan automobile plant. But me maybe wrong.